It could be the orgasmic waves that are following each other in a frequency that you probably cannot imagine. It could be those fantastic moments when you feel energy flowing between you and the masseuse. It could be the balancing of the chakras, when energy is flowing in you in an exploding way. It could be the whole moment of the massage which gives you pleasure and joy! Yet to me, I think, the most beautiful moment is right after the massage when the energy that the massage has brought up is flowing in me, I can feel it in my whole body, especially in my palms and chest, it is a feeling of love. “Coming the first time to Lotus I didn’t know what to expect. I was a bit nervous: what, how, who. I thought that perhaps you do not want to have as guest an elderly man, even with little overweight like me but only good-looking young lions? Then, what a positive experience it was to feel welcomed from the very first moment, after entering the spacious and tasteful facilities! From the very first time the massage has given me an amazing feeling: I totally forgot all daily worries. Coming to you is for me like I would sing the old song: ”stop the world, I want out!”. Lying down with my eyes closed, soft music playing, my body is enjoying royal touch of the strong bu gentle hands. Your small hands are strong on my my neck and shoulders, but so gentle on my muscles! Your hair gliding smoothly on my skin reminds me of the warm Caribbean wind. Meanwhile my mind just flies far away into the blue, carried by your hands. No words, there are only the hands and the music. After the physical massage there is also a mental one, the warm-hearted moment for tea and conversation with the masseuse. It helps me coming back to real life again and gives me a feeling of true caring. I feel a kind of holistic well-being in body and soul. And it is not over when I close the door behind me, no, the effect of the visit lasts long. 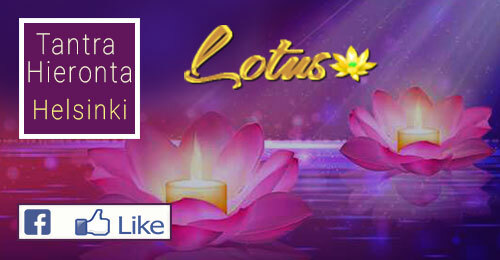 “Feeling a longer time stressed and non-motivated I happened to see Lotus ad. Decided to try. After booking and even just before ringing the door bell I still had some doubts about the treatment. The outcome could not have been different from all doubts. The first moment, the friendliness, the smile, the relaxing atmosphere, the elegant interior, everything made me feel welcomed and comfortable. Not to talk about the massage: it was not, as I had a bit suspected, some kind of touching or stroking all over my skin and body, but it was true skillful massage! You treat my skin smoothly and my muscles (e.g. back, shoulders, neck) often with unexpected strong hands. The way my body is treated makes me forget the present, the surroundings partially disappear. Different visits, different feelings. The way I experience the massage varies from time to time and I actually never know it in advance, for my body and soul have their own feelings and reactions which I may not need to be aware of. For me this is the big secret and joy in the massage: it always feels good but depending on my inner state of mind and body, my reactions may essentially differ from time to time. For sure, during the massage occur even tensions in my body, also sexual ones, but they never get a role of their own, never the main role. Being not an expert in the massage techniques it is difficult to explain, but in some way you move the tensions down, from the feet, upwards, finally ending with the head. For me the head massage is the real final: I come back to reality. A feeling of total relaxation, a ‘feeling of feeling well’, in my body and in my soul. “Diving into an Ocean of Energy, exposed to pulsating waves of excitement. Visited Lotus last weekend and could not have been any better experience. Masseuse’s soft and tender touches made me feel like in heaven. I arrived stressed and tense but left very relaxed. Just a perfect experience! Hello and thank you for the massages 2 months ago. All the masseuses have been excellent and very nice and i have enjoyed the massages every moment. One of you therapists said; we are like spices, everyone is little bit different.